Anti-Muslim discrimination is now central to Danish immigration and integration policies. It is ludicrous, not to mention unscientific to suggest that there are ghettos in Denmark, but fear of ridicule does not stop the Danish Ministry of Transport, Building and Housing producing a ‘ghetto list’ (ghettolisten). First published in 2010, and updated each year, the ghettolisten is accompanied by a highly stigmatising and inherently Islamophobic discourse about ‘vulnerable areas’ and ‘parallel societies’ of which there are fifty-seven, according to the government, twenty-five of which constitute ‘ghetto areas’, with sixteen within that described as ‘hard ghettos’. In March 2018, the government decided to introduce the ‘ghetto package’, consisting of twenty-two proposals aimed at regulating life in the ‘hard ghettos’ with the inherent threat that the package could be extended to the entire 57 ‘vulnerable areas’ if they don’t take improvement action. The neighbourhoods that most resemble a ghetto, according to the government, are Mjølnerparken in Copenhagen, Gadehavegård in Høje-Taastrup, Vollsmose in Odense and Gellerupparken/Toveshøj in Aarhus. The Danish government has five criteria for what constitutes a ghetto, and a neighbourhood has to flag up three of the criteria to be listed. A ghetto is defined as an area with a large number of immigrants from a ‘non-western background’, high rates of unemployment, with residents’ income, employment status, education levels and number of criminal convictions also taken into account. Needless to say, the very term ‘non-western’ is deeply problematic and seems to be used as a code for religion and/or skin colour, to stigmatise non-Muslim Danes and distinguish white Danes and Europeans from non-white Danes, immigrants and Muslims. While the very act of collating a ‘ghetto list’ is stigmatising, the rhetoric of politicians ensures that the stigma extends from a district to its people, with phrases like ‘ghetto children’ and ‘ghetto parent’ bandied about by powerful politicians who should know better and then popularised by the media. In his 2018 New Year’s speech, Danish prime minister Lars Løkke Rasmussen (Liberal party) said he would do everything in his power to counter social problems in marginalised areas. He spoke in muscular terms of how he would, if necessary, ‘break up concrete and pull down buildings’ because ghettos ‘reach out their tentacles onto the street’, and ‘cracks’ were appearing ‘on the map of Denmark’. With the ban, in May, on the wearing of full face veil coverings, and a citizens’ proposal to make Denmark the first country to ban circumcision of boys under the age of eighteen, 2018 has seen the intensification of processes that stigmatise Danish Muslims. Government spokespeople speak in highly assimilationist terms, warning that if families do not merge into the country’s mainstream through their own volition, they will be forced to do so, with immigration minister Inger Støjberg calling on Muslims to take leave from work during the Ramadan fast ‘to avoid negative consequences for the rest of Danish society’, as ‘the practice was dangerous to us all’. Støjberg seems to enjoy the publicity that surrounds the issuing of provocative statements. In March, she posted on her Facebook page a picture of herself holding a birthday cake to celebrate her fiftieth law change restricting immigration. Courts to be allowed to double the punishment for crimes such as vandalism, burglary, threatening behaviour, arson and offences against the drugs laws if they are committed in one of the ghetto neighbourhoods. A prison sentence of up to four years for ‘immigrant’ parents who force their child to take extended ‘re-education visits’ to their country of origin, damaging their ‘schooling, language and well-being’ in Denmark. More powers to local authorities to increase monitoring and surveillance of ‘ghetto families’. A mandatory pre-school programme whereby, from the age of one, ’ghetto children’ will be separated from their parents for at least twenty-five hours a week for mandatory instruction in ‘Danish values’. Noncompliance could result in welfare payments being stopped. Fines or even prison sentences for anyone who fails to report parents suspected of hitting their children. Quotas on kindergartens so that they can have no more than 30 per cent children from an immigrant background. The anti-immigration Danish People’s Party has attempted (so far unsuccessfully) to introduce other hard line measures, including an 8pm curfew for young people from ‘ghetto neighbourhoods’. Many political commentators refer to the kingmaker role that the Danish People’s Party plays in Danish politics, and the subsequent race to the bottom. In fact, the ‘ghetto proposals’ are supported by the mainstream political parties, including the Social Democrats and the Socialist Folkeparti, whose rhetoric on Islam has started to rival that of the Right in the last two years, with Social Democrat leader Mette Frederiksen calling Islam a barrier to integration, and suggesting that some Muslims ‘do not respect the Danish judicial system’, that Muslim girls are subject to ‘massive social control’ and that all Muslim schools should be closed. For local Aarhus activist John Graversgaard, there are other questions to be considered if we are to understand the full impact of Islamophobia on society. Yes, this stigmatising discourse represents an attack on Danish Muslims, but it could also serve a wider purpose. He believes that behind the rhetoric is a neoliberal project to reshape and reduce the role of municipalities and break down Denmark’s popular system of non-profit housing associations, providing opportunities for developers to demolish housing estates and take control of valuable city properties and land and socially cleanse these areas of the poor and the ‘immigrant’. 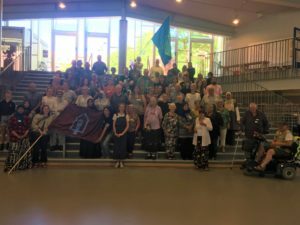 Opposition to Denmark’s ghetto package is growing – with campaigning not just in Aarhus but also in Copenhagen where the organisation Common Resistance (Almen Modstand) unites people from districts such as Aldersroesgade, Lundtoftegade, Munkevangen and Bellahøj. 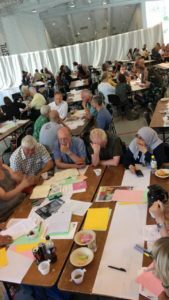 In September, the Institute of Race Relations, which is researching the connection between the policing of inequality and redevelopment policies in north London, will be going to Copenhagen. We will be meeting with residents from Copenhagen to discuss their concerns. The image of Denmark as a progressive country has been a false one for forty years. For instance in education, everything possible has been done to limit the possibilities of immigrants to maintain their mother tongues. They have been subjected to forced linguistic assimilation. The present government is now strengthening forced cultural assimilation through measures to oblige all children to attend monolingual, monocultural kindergarten from 12 months onwards. As Danish citizen living in Aarhus Denmark, I witness a sharp turn to the right, and a alliance between the Socialdemocrats and the right. Stigmatizing people living in so called “ghetto areas” have become mainstream. Demolition of non-profit housing is decided while people living there have a so called non-western background and a higher degree of social problems. It is a sad development with openly discrimination and racism. I’m just adding to John’s piece the latest news from Denmark. The ‘ghetto package’ was formally approved by parliament on 22 November, paving the way for the selling off or demolition of social housing. In addition, in December, a new law was passed making daycare mandatory for all children over the age of one in all the 43 neighbourhoods on the ghetto lis. Denmark’s Council for Socially Marginalised People say the new law is ‘obscene’ and the government should not ‘discriminate against people living in Denmark based on where their residence is located and whether or not they live in a so-called ghetto.